Over this last year of Plainfield United Methodist Church’s 134-year-old worshipping community, several people have become a part of our “broken pieces church” for a time. I noticed it last summer when the attendance of our very small congregation began to increase. We were in a time of discernment about our future, compelled to face the grim reality that we no longer had the human or financial resources to do effective ministry in our community. 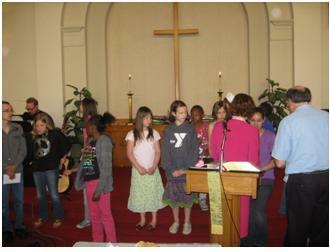 Our plight was known by the Grand Rapids United Methodist community because our twenty metropolitan churches have been intentionally supporting each other in various ways for a number of years. Our congregation of about twelve active members (the disciples) kept going because they were absolutely convinced that God wanted ministry to remain at this critical location of need in urban Grand Rapids for more than just a time. But we were tired and overwhelmed from plugging leaks, fixing boilers, repairing roofs, and wearing way too many hats. Almost every Sunday over the last twelve months we had at least one guest from another United Methodist church who was led by the Holy Spirit to offer support and encouragement for a time. These guests always lifted our spirits. When our pianist found another job, we hired a husband/wife duo who offered contemporary music to our congregation. We could have never paid Zach and Lindsay what they were worth, but they felt called to walk with us for a time and immediately elevated the energy level of worship. I soon noticed, however, that some of our guests kept returning. They didn’t join the church, but they became part of us. They were “all in.” Last fall Dorothy was on the way to her own church when she felt the Holy Spirit calling her to drive past the exit. She ended up at Plainfield UMC and was with us almost every Sunday over the past year. Dorothy’s husband died the year before after a long illness, and she was seeking healing. She wondered who she was in light of her loss and what plans God had for the rest of her life. It was just for a time, but Dorothy was a leavening influence on our congregation. A person of deep prayer and spiritual perception, Dorothy could tell who was struggling and spoke gently to church members after worship. She even came to our meetings “of the whole” and offered a fresh perspective when church members could not clearly discern the way. Dorothy found new meaning by giving herself away to us. Aileen, Steve, Ava, and Isaac decided to make Plainfield their home for a time when the White Pines UMC new church start to which they had been committed closed after teetering on the edge of viability for years. Even though Plainfield was another struggling congregation it became a tranquil resting place on the way and a place to regroup. Their very presence filled our church members with hope. Dale, the one who called us the “broken pieces church,” was a local pastor without an appointment after having faithfully led the White Pines UMC through their painful closing. At Plainfield he found safety, welcome, and unconditional grace in the knowledge that each one of us was also broken in some way. Dale, too, was here for a time and served as liturgist, committee member, and steady presence. Other White Pines refugees included Stephanie and her children John and Claire, and Charlie and his children Rose and Grace. They found Plainfield to be a place to recover hope. Teens John and Rose participated in the sermon on several Sundays. Other times the children would go to Sunday school and help with the ten to twenty neighborhood children who were hungry to learn about Jesus. These families, too, were with us for a time. Because they became part of us, we grew, learned, prayed, and healed together. Why did our for a time friends imitate the apostle Paul, who had a vision one night where a man of Macedonia pleaded with Paul to “come over to Macedonia and help us?” Convinced that God called his party to proclaim the good news to Macedonia, they set sail immediately. (Acts 16: 9-10). Why did our new friends respond to the prompting of the Holy Spirit to come and help us? All I know is that our congregation’s attendance more than doubled over the last year of our existence… for a time. All I know is that the atmosphere in our congregation changed from one of depression and despair to anticipation and excitement at what God was about to do with our broken pieces. The Holy Spirit seemed to literally dance around the sanctuary for months before our final worship service. I could see it, feel it, and was caught up in it myself. Was it something about our impending congregational death and rebirth as a new church restart that acknowledged death and resurrection in our own lives? Could it be that the letting go we experienced as a congregation was helping everyone to let go of whatever was preventing us from living fully in the midst of difficult times? Was it the joy of becoming something greater than ourselves, something God alone can see? Did we all become wounded healers for one another for a time? A critical lesson that I have learned from my year at Plainfield UMC is that it’s okay for church membership to be fluid. Over the years I’ve seen more and more people moving back and forth between churches for a time, but now I no longer get bent out of shape. I get it. After all, what business are we in, anyway? Is our mission to build our own fiefdoms, or are we called to build the kingdom of God? And if it’s God’s kingdom, then who are we to buck the Holy Spirit and become possessive of our own? Could it be that we live up to our calling as a connectional church when we share all of our broken pieces and together fit them together into a tapestry of shalom and hope for our world? Welcoming and caring for people who are in churches for a time is a cutting edge ministry that can no longer ignored. Perhaps they are in town for a six or twelve month work project. Maybe they are in emotional, physical, or spiritual transition and don’t feel able to go back to their own church. Perhaps they are peregrini, nomadic pilgrims who are “prone to wander” because they feel called to by God to various congregations for specific short-term ministries. Whatever the reason, our churches must find immediate ways for “for a timers” to connect, be active, and even participate in leadership, if appropriate. Don’t get hung up on membership. Don’t make the boundaries around participation too tight. At the same time let people be if they simply need to heal and only want to worship with you. And for God’s sake, don’t quench the Holy Spirit. Let the Spirit move where it will. Zach, Lindsay, Dorothy, Dale, Aileen, Steve, Ava, Isaac, Stephanie, John, Claire, Charlie, Rose, Grace, and others: your presence at Plainfield for a time has been one of the greatest gifts we could have ever received this year. Your steady presence has been a symbol of the great cloud of witnesses cheering on the Plainfield congregation. You have brought with you light, caring, faithfulness, peace, hope, joy, and the Comforter. Most important, you became part of us. “You make beautiful things out of the dust. You make beautiful things out of us. You are making me new.” God made something beautiful out of you for a time. Thank you, dear friends, for a beautiful and holy sojourn together. P.S. 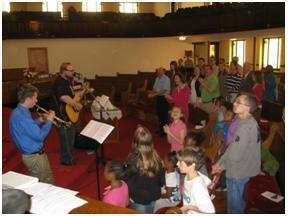 150 people “for a timers” graced Plainfield UMC yesterday for our last worship service before the new church restart. This entry was posted in dsblog and tagged Christian, Church, church growth, Grand Rapids, Holy Spirit, hope, Plainfield UMC, role models by Bishop Laurie Haller. Bookmark the permalink. Amen & Thank you Laurie!!! Thank you , Pastor Laurie. Your love and devotion, your openness with the Plainfield United Methodist Church congregation has been heart-felt. Your congregation fed breakfast to hungry street people, taught the children to take only what they could eat and you did the same with the spiritual food. As you stood in front of the congregation, using a simple music stand as a pulpit, you allowed the people to respond and they took heart. They sat with the stranger, took them down for refreshments and genuinely got to know them. The Stage has been set ( as you mentioned in your House Sale Blog) for the new church start.. God will raise up many witnesses from this Holy Ground. Laurie: I am so glad that you were there to shepherd these folks for the past year. and thank you, too, for sharing your growth and insight during this time. I think this is something we all must learn. The closing of Hudsonville United Methodist Church taught me the real meaning of the term “broken heart.” The “remnant” (as we were called) of our congregation spent a year together in our house church before we were ready to affiliate with new church families. I’m sure the Holy Spirit was with us helping us to remain faithful and hopeful and guiding us to places where we could best be of service to God’s people. I ‘m sure the same will happen for the Plainfield congregation. Wishing God’s blessings to all of you.